features agates from vast & beautiful lake superior that were formed by billion-year-old lava eruptions in minnesota. each agate is completely unique. this collection is close to my heart. the lake superior agate is the official state gemstone of minnesota, where I grew up. 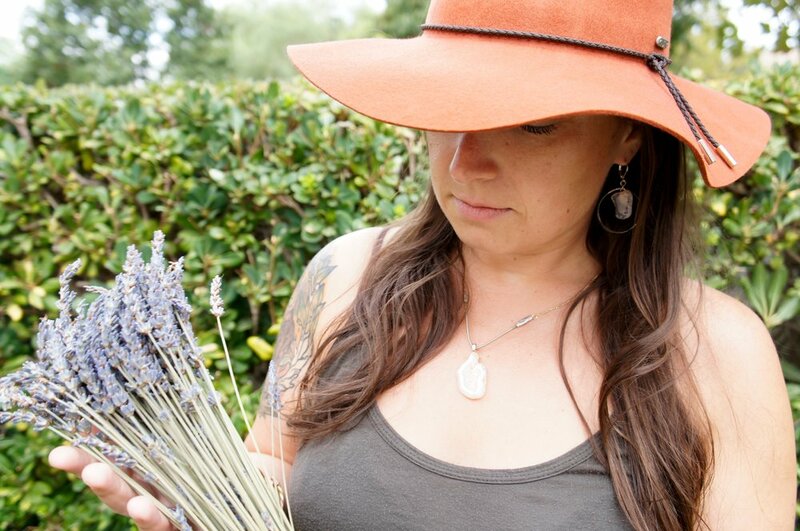 I asked fellow minnesotan, intuitive healer & ayurvedic bodyworker rachel lyn durga, to be our muse for the freshwater collection and asked her a few questions about the rich history of these stones & the land of ten thousand lakes. G: when were you last at the north shore? what were your impressions of the land & the lake? R: end of july this past summer in grand marais, minnesota. it was something out of a dream! the way that all of the elements come together is incredible. the lake appears no less than oceanic and its power surely matches. stone beaches of many-sized wave-smoothed varieties that inspire endless creative ideas — not excluding skipping the flattest ones back into water. so many unique features in the stones — amethyst, quartz and agates that melt into varieties of rusty orange to blood red from the iron content of the soil. basalt that gives vibrations from ancient nordic times. it’s all so impressive, nature holds answers. I walked in up to my ankles and that was intense cryo-therapy felt all the way into my cranial nerves — the combination of the cold water and stones on pressure-points on the bottom of my feet was an amazingly-intense yet so-simple healing moment. the freshly smoked trout harvested by responsible local fishers and wild-rice porter to end the day was pretty all-star also. G: what are the most notable energetic properties of lake superior agates? R: they are an interesting stone. a very grounding and earthly resonance yet strongly connected to the water element. the root chakra is most affected by the vibrations of these beauties. in vedic crystal healing, this stone would be most associated with the moon as a planet and with scorpio, cancer and pisces astrological signs. there are many different types of agates that may have varying properties. G: how do you feel in or around freshwater? R: I love it. water is such a beautiful neutralizer for the human body, mind and spirit. water is life. G: in what ways do you use crystals and stones in the work that you do? R: great question. thank you for asking. there are many ways I use crystals and stones in the work I do both for clients and for my own rituals. they are wonderful tools to incorporate into healing sessions to enhance the intention of the work. most recently I began to infuse compositions of crystals into tinctures as metaphysical healing tools — also used in the tinctures is small-batch apple brandy from the midwest. the first batch harvest is this month — so excited about these little self-work supporters. G: what are you excited about right now? what projects are you working on? R: I guess I just led right into this one! in addition to the crystal healing tinctures being ready for harvest and growing radiant heart apothecary, this month I’m preparing for a workshop on stepping into our divine feminine nature by way of self-care tools and personal development: a goddess energy empowerment workshop this october in minneapolis at spot spas. crystals and stones will absolutely be a part of this gathering!